Your Daily Link Fix: Native Trails’s Stylish Concrete Sinks; Is Brooklyn Bridge Surrendering? Is Brooklyn Surrendering? : Somebody has put white flags atop the Brooklyn Bridge and while the rest of us scratch our heads, NY Observer reveals how not amused borough president Eric Adams is. A New Look for the New Yorker: Fastco discusses the New Yorker’s new design, which is an easier read for smartphones, tablets and desktops alike. Where to Spot ‘Girls’ Filming Today: Bedford and Bowery tells us where to camp out to possibly catch a glimpse of the hit HBO show being filmed today. New Seating for Division Street Triangle: The Lo-Down NY has details on a new change to the ever-improving Division Street triangle, including a few new seats to come. 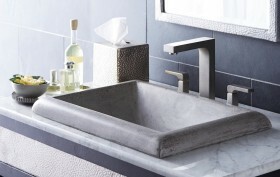 Native Trails’s Stylish Concrete Sinks: Freshome spotlights Native Trails’s stylish new sinks made from their new groundbreaking material called NativeStone.